The Softeze No Snore Pillow is a specially designed pillow that helps reduce snoring to promote a restful night’s sleep. Unique construction correctly positions head to keep airway passages open (the most common cause of snoring). 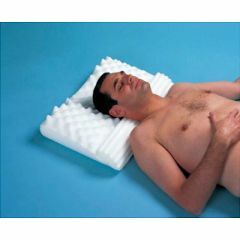 Maintains correct sleeping posture whether you sleep on your side or back. Polyurethane foam with washable cover. Size: 24" x 19".